Ascending Butterfly wanted to take a moment to send out heartfelt prayers to the families of both Michael Jackson and Farrah Fawcett. We pray that they are blessed with the strength they need at this difficult time. There are now 2 more stars in the sky! 6/25/2009 - Farrah Fawcett, the multiple Golden Globe and Emmy-nominated American actress best known for her role as the vivacious Jill Munroe in the 1970s television series “Charlie’s Angels,” died in a Santa Monica hospital. She was 62. 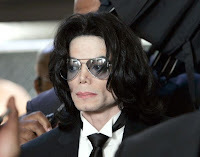 6/25/2009 - One of the world's most recognizable entertainers, Michael Jackson has died at the age of 50. Michael's album Thriller ranked number 20 on Rolling Stone magazine's 500 Greatest Albums of All Time list in 2003, and was listed by the National Association of Recording Merchandisers at number three in their Definitive 200 Albums of All Time. This thread will be open to comments, but they will be moderated. Please be respectful of their families.